How are park homes made? For many people around the UK, retiring and living day to day life in a peaceful, beautiful yet secure surroundings within a friendly like-minded community is something they dream of doing one day. Making it happen later in life can seem daunting, especially knowing where to start. However, choosing your park home and park home site with Sell My Group can make it easier. Sell My Group can offer you the straightforward advice enabling you to enjoy park living. The added bonus is that it may enable you to release capital as you downsize. The Sell My Group can help you relocate to a park home (along with park operators). With a new park, you maybe able to specify and select the exact build and pitch you would like, even down to choosing the luxury fixtures, fittings, furnishings. Brand new park homes do come fully furnished – even down to details such as your carpeting – which cuts out stress and expense for you freeing up time to enjoy your new home. So firstly, with the finer details of securing a park home established, what is a park home exactly? How does it differ from a bricks and mortar home? Well, even though park homes do look like spacious, solidly built bungalows complete with a pitched roof, there are so many more options during the build that is available than with a bricks and mortar residential property. Also of note, park homes differ completely in build quality and size from static caravans. Park homes are built to a higher standard; The BS 3632 Specification for Residential park homes and Residential Lodges. The standards are in place to ensure that you have a quality permanent place of residence. What are park homes made of? Park homes are constructed from solid timber and steel frame construction. The build time can be made made in as little as two weeks depending on the size of the factory, production line and workforce. To comply with quality and high standards modern equipment is used to ensure that each park home is meticulously constructed. So how are park homes made? There are a number of steps in the build. Usually a manufacturer will start on the floor which will include the plumbing and initial electrics. The floor cassette is insulated and tested before erecting the internal walls. The next step will usually involve cranes moving the walls onto the home itself. After the walls the focus is on the roof, which is usually made at ground level to ensure a quality build. After that it is the internals and preparation for the personalised décor as well as final electrics and further insulation. The next step is the external finishes, here the customer may get to specify which weatherproof finish they want. This is all subject to planning consent of the park and the park operators own desires – stucco and wooden cladding are popular choices. Next is further personalisation of kitchen and bedroom choices, from fitted wardrobes, carpets, to further utility room layouts. The next step moves into the bathroom and en-suite fittings. Here the manufacturer will fulfill your choice of tiling, length of bath, taps and even how powerful your shower is. After this it’s carpets and final electrics. Finally there is a last check to ensure that your specified choices line up with your finished park home. Each park home is then independently inspected for further peace of mind and to ensure sound insulation. Production works closely with you throughout to match quality of home with quality of life. There are so many benefits of living in a park home; the minimised square footage is easy to maintain, removing the stress of repairs, stairs and sprawling gardens. Having your own private parking with your park home and maintained grounds and paths allows for a truly accessible and stress-free, peaceful lifestyle. Secondly, a park home awards you with the ability to live in a desirable, beautiful area of the country at a much lower cost. Sites are often set away from the hustle and bustle nestled in lush countryside, your peaceful bolthole for a brief break or your very own all year-round haven. Rather than trying to, you can relax into your own retreat. Whether you prefer hearing the sound of the sea or a rooster as you wake, or rural church bells as you settle down for the evening, the hundreds of properties available offer a tailor-made location surrounded by exactly what you prefer, no compromises. As well as offering you your perfect location a number of Park home sites have wardens and grounds keepers giving you that extra security and care that you deserve in your golden years. CCTV and gates are always something you can select for further peace of mind. Furthermore, each park has its own set of rules to protect its residents and enable you to have at extra choice and peace of mind. Last but not least, with the ideal location comes that idyllic sought-after lifestyle. With most park homes and sites being exclusively developed and planned out for the retired and semi retired. So whether you like walking the dog, living by the seaside, exploring the countryside or visiting stately homes, there’s a park for you. Being able to choose from the hundreds of locations up and down the country makes it even easier. Why not browse through our search to give you an idea. 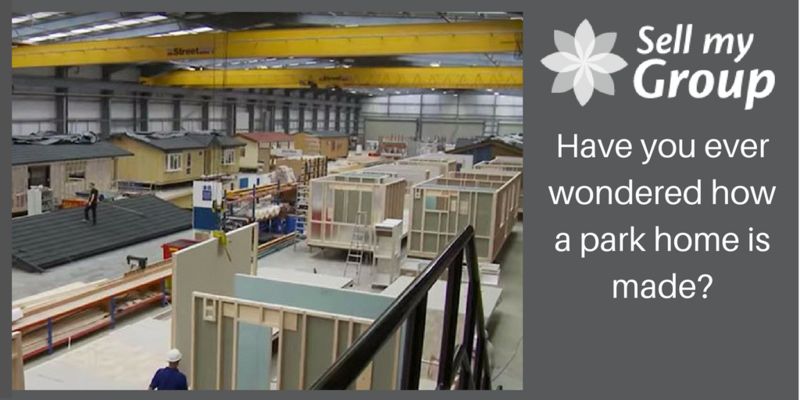 So now you know how park homes are made, you can view the selection on the Sell My Group website or for further advice on park homes on subjects including park home maintenance, internal design or help with buying, take a look at other articles on the Sell My Group blog.